Mercedes' original A-Class, which launched back in 1998, was remarkably innovative for a family hatchback. Spurning the familiar hatchback design sported by the likes of Volkswagen’s Golf and Ford’s Focus, the A-Class looked like a mini MPV. However, while it had bags of space for all passengers, its upright driving position and dull driving experience hampered its success. 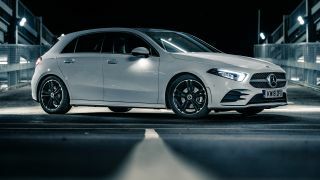 Fast-forward 20 years and things look a lot more conventional from the outside, with this latest fourth-generation model hard to tell apart from the more traditional hatchback styling of the third iteration of the A-Class. But that’s just half the story. As mentioned, the looks of the new A-Class are an evolution of the more traditional styling of the outgoing model. The mature and sleek looks certainly make it much less divisive than the original model, but to our eyes it doesn’t quite match the sharp lines and stance as the king of the hatchbacks, the VW Golf. Climb inside and you’re transported into the future, with an interior nothing like we’ve seen on any other car. That's because this is the first Mercedes to get what the company calls its MBUX infotainment system; and while you could be forgiven for expecting Mercedes to reserve its latest tech for its flagship S-Class model, it’s great to see it right here in one of its most affordable models. MBUX is an acronym for Mercedes Benz User Experience, which sees the A Class ditch conventional dials in favor of large widescreen cockpit featuring two displays running across the dashboard. Base A-Class models will feature two 7-inch screens, while pay a bit more and you'll get one 7-inch and one 10.25-inch display, and go for a top of the line model like the one we test drove and you get two 10.25-inch displays. It certainly looks very slick, with the steering wheel adorned with buttons and dials to control the two displays. Alternatively, there’s a touchpad in the central console that can also be used to interact with the A-Class – and if that isn’t enough, the central screen is also touch-sensitive. The quality and clarity of the cockpit are excellent, thanks in part to the 1920 x 720 pixel resolution of the two 10.25-inch displays. The instrument cluster has three styles to choose from, while the seating position, ambient lighting, favorite radio station and orientation of the navigation map can be saved as a profile. Complaints? You’ll either find the way the color of the vents changes from blue to red when you increase the cabin temperature (and vice versa) a nice touch or a bit of a gimmick, while the overall premium level of materials is let down by the rather spindly and plasticky column stalks that operate the indicators and transmission; they feel very much like an afterthought. It’s not just the tech on show that’s striking; what you can’t see is equally impressive, namely the A-Class’s speech recognition system. It’s activated via a button on the steering wheel, or by simply saying “Hey Mercedes”, and will understand commands like “When will we get there?” and give you an ETA, while on the rare occasion it doesn’t understand the question, it uses learning software that’s updated over-the-air throughout the car’s life to expand its repertoire. This will also see the A-Class learn new buzzwords and adapt to changing uses of language over time. Along with its clever voice activation, the MBUX is also designed to anticipate what the user would like next. As an example, if you listen to one radio station on your morning commute and then regularly change station to listen to the news on the drive back, the MBUK will suggest this. The same goes for calls – if you regularly phone someone on the journey home, such as your mum or partner, you’ll receive their telephone number as a suggestion on the display. There are still more clever touches when it comes to the sat nav (if you opt for the Advanced Navigation Package). Using a forward-facing camera that’s tucked away in the grille of the A-Class, the system displays the road ahead on the main infotainment screen and highlights upcoming turns and junctions with a neat blue arrow. This can be really helpful – we found it a big help when negotiating winding country roads at night', with no missed turnings. For now at least, the A-Class will be available with three engines: a 1.5-liter diesel and two petrol options, a 1.3-liter and 2.0-liter. There’s no manual option, with all models getting a 7-speed automatic transmission. We drove the A200 variant, which you might expect would be the 2.0-liter petrol, but was in fact the 1.3-petrol. This four-cylinder engine has a power output of 163bhp, and can hit 60mph in 8 seconds. The engine is nice and smooth below 4,000rpm, while find a good road and switch to the ‘Sport’ mode and it can be great fun. While we’re left a little underwhelmed by its exterior looks, the A-Class doesn’t disappoint inside – and that’s where you’re going to be spending most of your time. The sleek widescreen cockpit and array of advanced tech on offer is mightily impressive, and is complemented by a cabin that has a lovely premium feel. It’s certainly got the wow factor, and we like it a lot.